I've been on a hiatus from blogging for a while now, but that doesn't mean nothing's been on my mind. Quite the contrary. Syria. The election. Police. It's all hard to turn off. But something happened last week that sent me back to the Balcony View. Thankfully, I remembered my password. Players make plays is probably my favorite sports saying. The line between the joy and despair of athletics is often microscopic. When the stakes are high and the outcome uncertain, someone has to make a play. Coaches talk about players who want the ball in their hands at that moment. They don't fear failure. They just want to make the play. 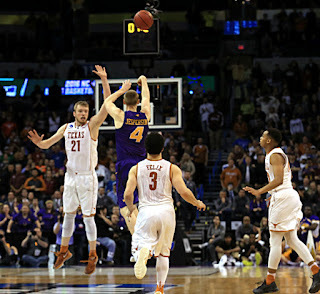 Paul Jesperson's half court shot that lifted the Panthers over Texas in the 2016 NCAA Men's Basketball Tournament comes to mind. A player doing what he does. Happy for the opportunity. I'm not one to confuse sports with more important things in life, but it's true that there are so many parallels.